Our Blackstone exhibit opens in London! Our first traveling exhibition, “250 Years of Blackstone’s Commentaries,” is now on display in the library of the Honourable Society of the Middle Temple, in London. There is no more fitting location than this, since the Middle Temple was the Inn of Court that Sir William Blackstone belonged to. Renae Satterley, Deputy Librarian of the Middle Temple, reports that over 2,400 visitors saw the exhibition during the weekend of September 18-19, during an open house co-sponsored by the Middle Temple, the Inner Temple, Temple Church, and the Royal Courts of Justice, “Revealing Magna Carta.” This was part of an even larger city-wide event, Open House London. A gallery of photos of the Middle Temple’s open house is on Flickr. The exhibition will remain on view until late November in the Middle Temple Library. To visit the exhibition, please contact Renae Satterley (phone: 020 7427 4830) to schedule an appointment, since access to the library is normally restricted to members of the Inns of Court. In December, the exhibition will travel to the Sir John Salmond Law Library at the University of Adelaide. It will remain on display there through February 2016, and will coincide with the 34th Annual Conference of the Australia and New Zealand Law and History Society. “250 Years of Blackstone’s Commentaries” marks the 250th anniversary of the publication of Sir William Blackstone’s Commentaries on the Laws of England, the single most influential book in the history of Anglo-American law. It features over 40 items from the Yale Law Library’s Blackstone Collection, the largest and most comprehensive collection of Blackstone’s works in the world. The exhibition was curated by Professor Wilfrid Prest of the University of Adelaide and Mike Widener, Rare Book Librarian at the Yale Law Library. A full-color catalog of the exhibition may be downloaded for free from the Yale Law School Legal Scholarship Repository. A special thanks to my colleague at the Middle Temple, Renae Satterley, for making this Blackstone homecoming possible. Visitors viewing the Yale Law Library exhibition, “250 Years of Blackstone’s Commentaries,” in the Middle Temple Library in London, 19 September 2015. ©Paul Clarke by permission of Inner and Middle Temple. New exhibit: "The Pope's Other Jobs: Judge and Lawgiver"
The Pope is universally known as the spiritual leader of the Roman Catholic Church. But it is often forgotten that for much of the papacy’s history the Pope was the most important judicial and legislative authority in western Europe. A new exhibition at the Yale Law Library, “The Pope’s Other Jobs: Judge and Lawgiver,” illustrates the Pope’s legal responsibilities throughout history using rare books and a medieval manuscript from the Law Library’s outstanding collection. It is curated by Anders Winroth, Forst Family Professor of History, Yale University, and Michael Widener, the Law Library’s Rare Book Librarian. Winroth is one of the world’s leading authorities on medieval canon law. 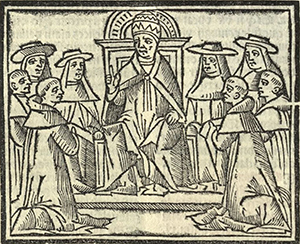 “In the Middle Ages, canon law (the law of the church) took center stage as a most sophisticated legal system, not only inspiring much secular law but also becoming recognized as the sole authority in several legal fields, such as the law of marriage, the law of just war, and the legal implications of oaths,” said Winroth. The books and manuscripts in the exhibition show how the papacy has shaped areas as diverse as human rights, international boundaries, due process, and marriage law. Many of the legal rights that Americans take for granted, such as the presumption of innocence and the right against self-incrimination, are rooted in the decrees and judicial decisions of medieval popes. The exhibition is on display September 8-December 15, 2015, in the Rare Book Exhibition Gallery, located on Level L2 of the Lillian Goldman Law Library, Yale Law School (127 Wall Street, New Haven, CT). It will also appear here in the Yale Law Library Rare Books Blog.